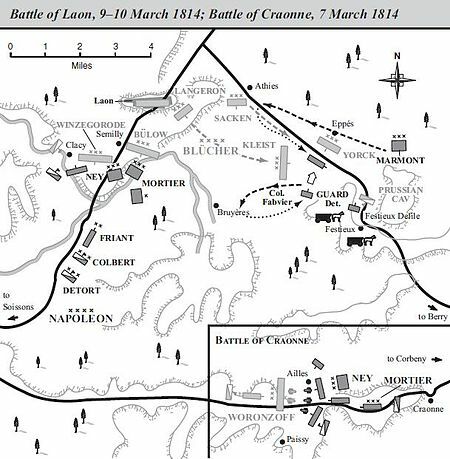 The Battle of Montereau 18 February 1814. 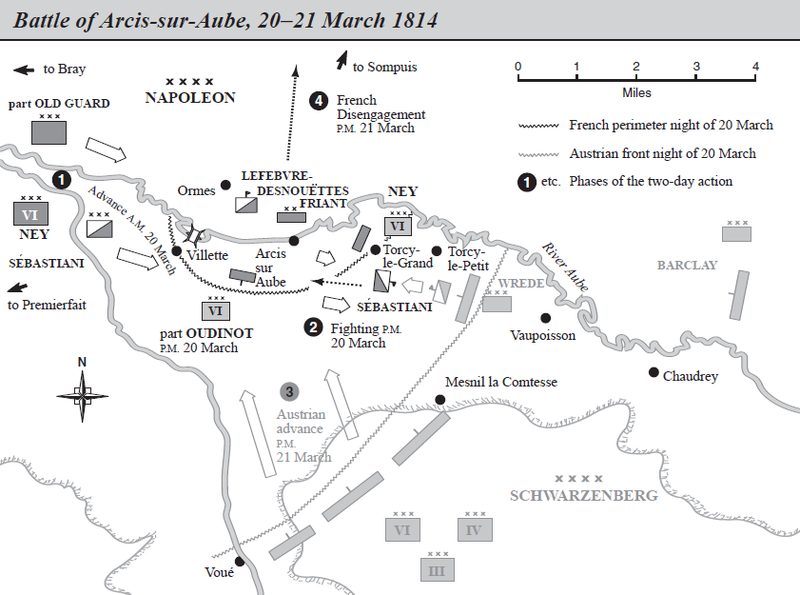 Napoleon defeated Prince Gebhardt von Blücher’s Army of Silesia at the Battles of Champaubert, Montmirail, Château-Thierry and Vauchamps between 10 and 14 February 1814. However, Prince Karl Phillip zu Schwarzenberg’s Army of Bohemia had taken the offensive in the Seine sector. Click here for a campaign map from West Point’s website and here for a map of the Battle of Montereau. Napoleon left the corps of Marshals Édouard Mortier and Auguste de Marmont to cover Paris in case Blücher resumed the offensive. He took the Imperial Guard and General Emmanuel de Grouchy’s cavalry 47 miles south in 36 hours, with some of his infantry travelling in wagons and carts. He entered Gugnes at 3pm on 16 February. Including the troops that were already in the Seine sector, Napoleon now had 60,000 men with which to attack the Army of Bohemia. He was heavily outnumbered, but Schwarzenberg’s four corps were widely spread. General Friedrich von Bianchi’s Austrians, General Karl Phillip von Wrede’s Bavarians, Prince Ludwig Pyotr Wittgenstein’s Russians and the Württembergers under their Crown Prince, were advancing along separate roads. Poor connecting roads, mud and the Seine made it hard for them to stay in contact with each other. Marshal Claude Victor’s corps was supposed to have taken part in these two actions, but moved slowly. Victor, Gérard and Grouchy, along with General Claude-Pierre Pajol’s cavalry, were then ordered to advance quickly to Montereau. Napoleon wanted to beat the retreating Army of Bohemia to Troyes. Victor had been ordered to reach Montereau at 6 am on 18 February, but paused overnight, allowing the Württembergers time to prepare their defensive position. The first French troops to arrive were 1,500 cavalry, 3,000 National Guards and 800 gendarmes under Pajol. They were poorly trained, and were unable to make any progress against the Württemberg corps of 8,500 infantry, 1000 cavalry and 26 guns. Victor’s advance guard did not arrive until 9 am. His initial attacks were unsuccessful. Napoleon, angry at his tardiness, replaced him with Gérard. Napoleon and the Guard arrived at 3 pm. The French now had 30,000 men and 70 guns on the field, and the Württembergers withdrew in the face of new attacks. They lost 5-6,000 men, 3,400 of them being captured, and 15 guns. French casualties were 2,500 killed and wounded. The defenders had the Seine behind them, with only one bridge to retreat across. A final French cavalry charge, in which Pajol was so severely wounded that he took no further part in the war, captured both the Seine bridge and one over the Yonne before the Württembergers could blow them. F. Loraine Petre suggests that they should have retreated and destroyed the Seine bridge as soon as they were attacked, but Schwarzenberg had ordered them not to do so. On the same day the French reached the Seine at Nogent and Bray, only to find the bridges had been blown. As they then had no bridging train, the capture of the bridge at Montereau was vital. They also took a bridge over the Yonne as after the battle of Montereau. Schwarzenberg now ordered his army to retreat to Troyes, less Wittgenstein’s corps, which was to link up with Blücher at Méry by 21 February. Napoleon, who now had 75,000 men with him, pursued rapidly with the intention of fighting Schwarzenberg near Troyes on 23 February. Schwarzenberg had 90,000 troops and Blücher 50,000. However, Alexander Seslavin, a Cossack commander regarded as ‘very reliable’ by his superiors, had reported that Napoleon now had 180,000 men. Petre notes that Schwarzenberg was worried about ‘the incalculable results of defeat.’ He was also concerned by the threat to his line of retreat of from Marshal Pierre Augereau’s corps in the south, ‘unnecessarily’ according to Chandler. Schwarzenberg therefore decided to withdraw his army to Troyes. He ordered Blücher to retreat his army, including Wittgenstein’s corps, across the Marne. Chandler contends that ‘Schwarzenberg’s inglorious but probably justifiable caution thwarted Napoleon of a decisive action.’ He goes on to argue that the Emperor had outmanoeuvred and outfought two enemy armies that both outnumbered him, but could not win a military victory because he lacked the necessary manpower and France was war-weary. If I had accepted the historical borders I would have taken up arms again two years later, and I would have said to the nation that this was not a peace that I had signed but a forced capitulation. D. Chandler, The Campaigns of Napoleon (London: Weidenfeld & Nicolson, 1966), p. 978. Troop strengths in this and the previous paragraph are from are from Ibid. French casualties are from Ibid., p. 980, which says that Württemberg casualties were 6,000. Other numbers in the last two paragraphs are from F. L. Petre, Napoleon at Bay 1814 (London: John Lane, The Bodley Head, 1914), pp. 83-85. Quoted in D. C. B. Lieven, Russia against Napoleon: The Battle for Europe, 1807 to 1814 (London: Penguin, 2010), p. 490. Channel 5 in the UK broadcast a documentary called The Nazi Killers on Friday 22 November. For UK viewers it is available on the 5 Demand online catch up service until 22 December. According the filmmakers’ website, it has been shown in other countries at various film festivals and on the Discovery and History channels under the title The Real Inglorious Bastards. Documentary exploring one of the hundreds of undercover missions launched by the US government’s Office of Strategic Services during World War II. Operation Greenup consisted of two young Jewish refugees and one Wehrmacht officer, who parachuted one winter night into the Austrian Alps and risked their lives to strike back at Nazi Germany. It featured a few re-enactments, but most of the story was told by the two Jewish refugees, Hans Wijnberg and Fred Mayer, with the widow and son of Franz Weber, the Wehrmacht officer, also contributing. Mayer was the son of a German WWI veteran. He and his family escaped to the USA in 1938. Wijnberg was sent by his parents, along with his twin brother, from the Netherlands in 1939to live with his father’s business partner in the USA in 1939. His parents and younger brother were all murdered in the Holocaust. Both men joined the US Army, and were then approached to join the OSS, the US intelligence service, because of their language skills. It trained them for operations behind enemy lines. Mayer was put in command of Operation Greenup, with Wijnberg as his radio operator. Their mission was to gather intelligence in the Tirol region of Austria. It was feared that the Nazis would establish an Alpine redoubt in order to make a last stand there. The team needed somebody with local knowledge, and Franz Weber, an anti-Nazi local who had deserted from the German Army to the Allies, volunteered to join it. The three were to be dropped by parachuted near Innsbruck in February 1945. It was difficult to find a suitable drop point, as the obvious places were all occupied by the enemy. A pilot called Billings volunteered to drop them on a glacier. All three landed safely with most of their equipment, but the canister containing their skis was lost. They therefore had to walk in deep snow to Oberperfuss, Weber’s home village. There they were helped by his family. Operation Greenup’s purpose was intelligence gathering. Mayer obtained a German uniform and impersonated a wounded officer. This enabled him to pick up information from other German officers, which Wijnberg relayed back to the OSS. One of their pieces of intelligence enabled the Allied air forces to bomb a large number of trains in a nearby marshalling yard. Mayer was then ordered to investigate a nearby underground factory that was building Me 262 jet fighters. He infiltrated it by obtaining work as an electrician, using a French translation of his own name, discovering that supply problems with parts meant that no aircraft were being completed. Mayer was then betrayed and captured. Wijnberg and Weber had to flee, whilst Mayer was tortured by the Gestapo. His two interrogators discounted the possibility that he might be Jewish, because their anti-Semitism meant that they refused to believe that a Jew could be brave enough to withstand their tortures. The interrogation was watched by a third man, who eventually took Mayer to the house of Franz Hofer, the local Gauleiter [Nazi Party boss]. By this time Hofer, like many Nazis, realised that the war was lost and was interested only in surrendering to the Western Allies rather than the Soviets. Mayer was allowed to send a message to the OSS. When US troops approached Innsbruck he met them and informed them that the city was willing to surrender. The documentary ended with Fred Mayer talking to Hans Wijnberg via Skype. Wijnberg died shortly afterwards. Both programme titles are somewhat misleading, since the members of Operation Greenup were tasked with gathering intelligence rather than directly killing Nazis, and the only connection with the film Inglorious Basterds is that they were American Jews operating behind enemy lines. It was a good documentary. There were some contributions from historians, mainly to set things in context, and some re-enactments in the absence of archival footage, but the story was told largely in Mayer and Wijnberg’s own words.